Talybont Community Orchard was planted in 2017/18 by people living in and around our village. The project is led by the Community Council as a part of its aim to further enhance our area for local people, visitors and for wildlife. Our orchard is one of 14 community orchards in Wales established or regenerated under the guidance of the Welsh Perry & Cider Society and underpinned by funding from the Heritage Lottery Fund. Local advice and support was generously provided by The Green Valleys and by Brecon Beacons National Park wardens and volunteers. We've planted a mix of traditional apple (eaters, cookers, cider) and pear (eaters, perry) varieties from Wales and the Welsh Marches. 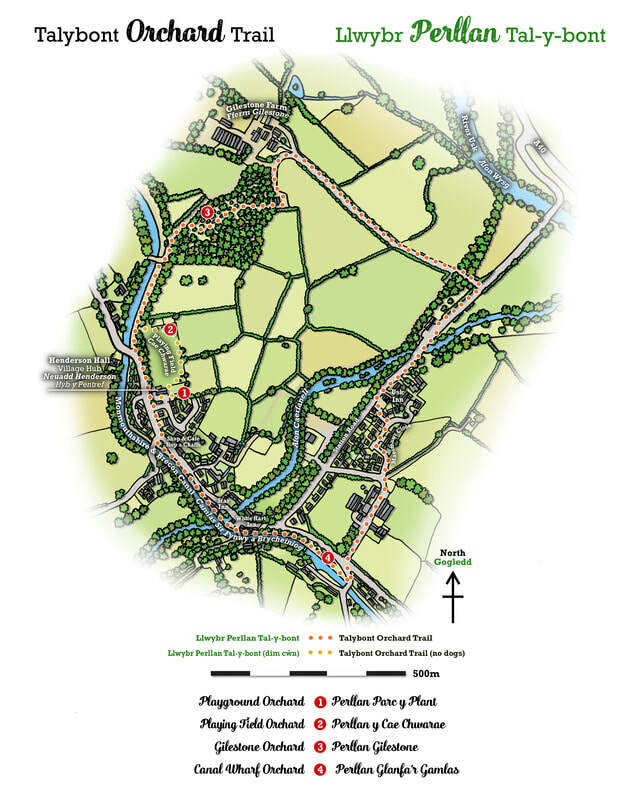 The trees are clustered at four locations around the village and a new 3km / 2m circular 'Orchard Trail' has been created to help you to experience the sites and explore our village. Two of the orchards are sited on Community Council land, whilst the others have been generously granted permission from Gilestone Farm and from the Canal & River Trust. ​Orchard and trail information can be found on the information panel at Henderson Hall, LD3 7YQ. OR pick up a leaflet from the Village Hall, Cafe, or pubs. Be respectful of the Maesmawr Close and Farm neighbourhood and cautious of traffic when crossing the lane and along Station Road (no pavement).